Considering getting a Canaan Dog? 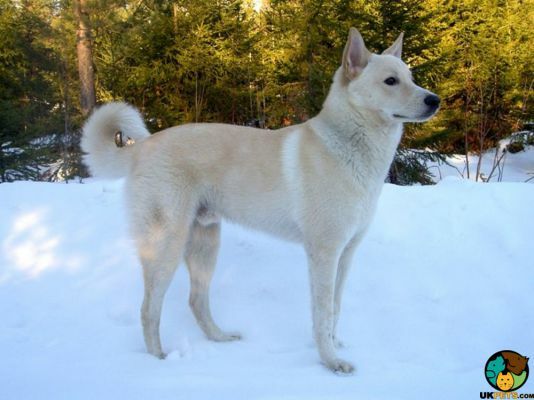 The Canaan dog is an ancient breed with origins from the ancient lands of the Israelites, Canaan. It was bred as a herding dog by the Bedouins and is an excellent guard dog during World War II. Canaan dogs are gentle, docile and extremely protective and territorial. Canaans are medium in size, weighing 35 to 55 pounds and standing 40 to 60 centimetres tall at the withers. Canaan dogs have an average lifespan of 12 – 15 years. 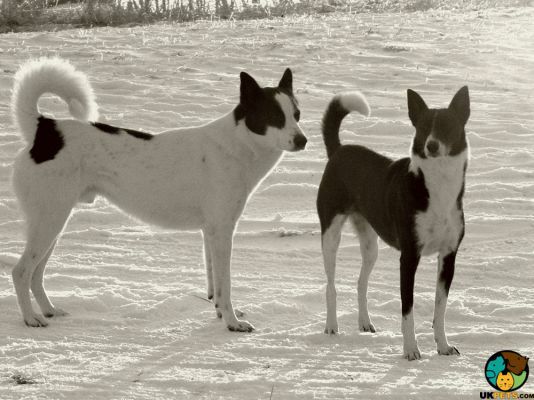 Are you looking to own a Canaan dog? Here is a brief background of this ancient dog breed. The Canaan dog is believed to be the most ancient dog breed in the world. The origins of the breed were reportedly found in the ancient land of Canaan, the land of the Israelites (now Lebanon, Palestine, Israel and some parts of Syria and Jordan). This claim is supported when Archaeologists unearthed 700 dog skeletons during an excavation in Palestine that are anatomically similar to Canaan dogs today. At that time, this dog breed was referred to as the Dog of Canaan or Kelev Kanani. However, this ancient dog breed was driven out together with the Israelites when the Romans came 2,000 years ago. Reportedly, some dogs survived extinction when local Bedouins captured several wild Canaan dogs to help guard and herd their cattle. 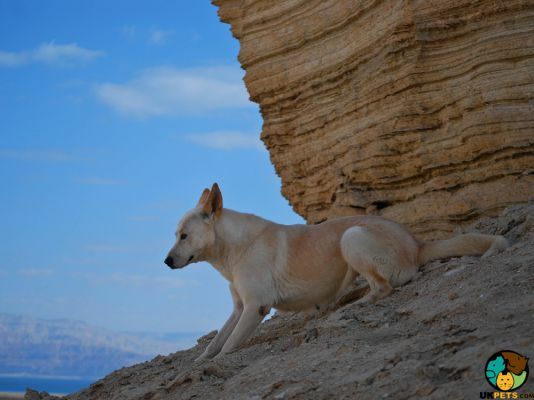 For centuries, the Canaan dog breed continued its free life in the desert with the Bedouins, until World War II. Isolated Jewish settlements needed dessert-tough guard and patrol dogs. Rudolphina Menzel, a professor of animals and comparative psychology at the University of Tel Aviv, was tasked to develop a dog breed that meets those needs. She captured some wild Canaan dogs and started her breeding program. In 1948, the Palestine Kennel Club recognised the dog breed and registered some 150 Canaan dogs trained to perform sentry work, and landmine detection. In 1965, the first Canaan Dog Club of America was formed when Ursula Berkowitz of Oxnard, California imported the dogs in America. It was only in 1997 that the American Kennel Club recognised the Canaan dog as a breed while The United Kennel Club had already recognised the dog breed a few years earlier in 1992. Canaans weigh 35 to 55 pounds and stand 40 to 60 centimetres tall at the withers. It has a broad wedge-shaped head with the top flat between the ears. The dog breed boasts of a well-defined stop, long muzzle and nice black nose. Its almond-shaped eyes are dark in colour with black rims. This dog breed has a strong jaw with perfect scissor bite. Their necks are well-muscled and slightly arched, shoulders are laid back, and legs are straight and strong. Canaan dogs wear a double coat designed to protect them in extreme temperatures of the desert. The undercoat is short and soft, often thick depending upon the climate where the dogs live. Its topcoat is straight and rough that lays flat against the body. The coat comes in a variety of colours that may be white or white with patches of colour, solid colours that range from black to brown, sandy, red or liver. Solid brown or tan Canaan dogs often have shades of black. Grooming a Canaan dog is easy since it doesn’t shed much. Weekly brushing will suffice to keep loose hairs to a minimum and maintain its coat. However, it may shed a bit more twice a year (spring and autumn), so frequent brushing may be required. Bathing is only needed a few times a year since Canaan dogs are notoriously clean dogs that do not emit a canine odour. It is important to do basic grooming that includes checking the dog's ear on a regular basis, brushing its teeth to maintain oral health, and trimming its nails. The Canaan is an alert and vigilant dog that is devoted to its family. It is reserved around strangers but should never be aggressive. This dog breed is naturally territorial, which makes the Canaan dog an excellent watchdog. It barks only to alert but will quickly settle down once its human takes over the situation assuming that the Canaan regards its owner as the leader of the pack. Canaans are highly-energetic dogs that love to run. They are agile breeds that can completely change directions at high speed. This dog breed requires several hours of outdoor activity to get its healthy dose of physical and mental stimulation. Canaan dogs that are bored tend to become high strung and destructive. They are extremely intelligent and good problem solvers. Thus, it is important to enrol your Canaan to agility training, herding and tracking activities for its mental well-being. Canaan dogs are not the best choice for first-time owners taking into account its training requirements. They're good pets and will protect their family. They can form strong bonds with the children, but like any dog breed, interaction must be strictly supervised. It is important that this dog is socialised at a young age. Canaan dogs are known to be aggressive and territorial around other dogs, and they may perceive other small animals as prey. A typical serving of an adult Canaan dog is 1 1/2 to 2 1/2 cups of premium quality dog food per day. Each dog will have different nutritional requirements depending on their age, size and activity level. If you can't decide what and how much to feed your Canaan dog, don't hesitate to consult your veterinarian. Canaans are energetic dogs that require more protein. Like all dogs, this breed can easily gain weight so owners should avoid free-feeding. Canaan dogs are generally healthy but may suffer from a few health conditions. These health issues may include Hypothyroidism, Epilepsy, Progressive Retinal Atrophy, Cryptorchidism, Hip and Elbow Dysplasia, Luxating Patella, and Osteochondritis Dissecans. As very active dogs, Canaans require a lot of exercises. They need more than daily walks. They will do well with more vigorous activities that are physically and mentally stimulating, such as agility training. The average purchase price of a Canaan puppy is around £500. However, you have to be on a waiting list. Only a few puppies are registered with The Kennel Club per year. After the initial cost of purchasing the puppy, other expenses to consider include food costs, which are around £40 to £50 a month and veterinary bills of about £1,000 per year. The latter covers the cost of initial vaccinations, annual boosters and neutering cost. When it comes to veterinary consultations, unless you have pet insurance, medical treatments may cost a lot more than the usual. To offset some vet bills, you can opt for a basic pet insurance cover, which is around £22 a month or a lifetime insurance policy of £42 a month. On top of all this, you also need to consider the basic dog supplies and equipment that include buying a leash, collar, bed, bowls, and toys. Canaans will need agility training, which is another cost that you may want to factor in. Excluding for the training and the insurance cost, caring for a Canaan dog will set you back roughly about £70 to £100 a month. Is a Canaan Dog Right for You? Canaan dogs were bred to herd and guard which makes them sound watchdogs. They are devoted family pets and can be docile. They are highly intelligent and quick to learn, but their independent nature may prove to be difficult in training. Canaans are light shedders except during autumn and spring. Canaan dogs are a rare breed, and you will have to be on a waiting list to get one. They need more than long walks for an activity so agility training is important.